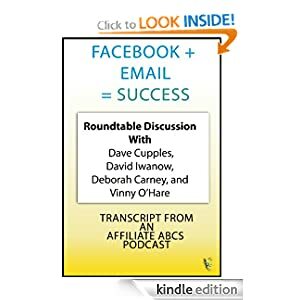 Facebook + Email = Success (Deborah Carney, Vinny O’Hare, Dave Cupples and David Iwanow) This book is a guide on how to make money on Facebook by combining fan pages with email marketing. *This is a transcript of a roundtable discussion between affiliate marketing experts and facebook experts* Three of the four have spoken at the largest conference focused on affiliate marketing in the US, Affiliate Summit. Dave Cupples traveled from Australia to New York City to speak, and has now spoken around the world.